Home KNOW YOUR TOWN RICH HISTORY: The first descendents of Asian origin to settle in Thika. RICH HISTORY: The first descendents of Asian origin to settle in Thika. 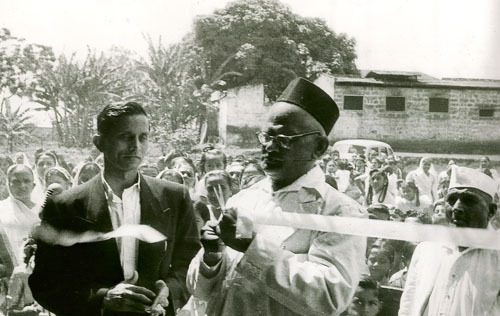 Mepa Punja Shah during the opening ceremony of their new construction in 1957. At the beginning of the last century, the first people of Asian descent started migrating from India to Kenya in dhows. By then, Thika was a main centre after embarking at Mombasa. The earliest to settle in Thika – Shah Meghji Ladha and Meghji Kanji – coming to the area in 1910. Later some more Indians settled in Thika, near the present day Blind School, with others settling in Makindi which was about 7 kilometres away. They lived in wooden and iron sheet houses and used water for their domestic use from the nearby Chania River. There was no electricity until 1924 and Thika Water Works also started thereafter. They had a passion for business in their blood and soon started small scale businesses after the First World War. In the old clock tower still planted at the roundabout (Githaa-ini) on Kwame Nkrumah Road, stood provisional and agricultural stores. They later built shops and homes out of iron sheets. The first shop in old town was started by Jamal Hirji Ojami in 1914. Towards the end of the 19th century, outsiders began to settle in this outpost as a convenient resting spot between Nairobi and the upcountry highlands for British settlers. Majority of the settlers who came to the area were of British aristocracy, of British English Anglo-origin. By 1913, it was already a favourite camp for big-game hunters and beyond it there was only bush and plain. Other whites came to Thika shortly after that and started coffee plantations. By 1933, the Asian population had grown to nearly 280. Premchand Vrajpar, Meghji Kanji, Ladha Khimji, Vershi Mepa, Meghji Lakhamshi, Hemraj Ladha and others got together and formed the Oshwal community. With this, Shree Visa Oshwal Jain Gnati Mandal was established in 1934 and the name was later changed to Shree Visa Oshwal Gnati. They approached the then Town Advisory Board for land to build their own community hall. The Board agreed to give one acre of land in the name of ‘Jain Church Committee’. On 18th February 1935, Hemraj Ladha laid the foundation stone for the buildings. Education at that time was at the Government Indian Primary School (now Gatumaini Primary School) and for higher education, Oshwals had to go to Nairobi where they stayed at the Oshwal boarding. Most of these Oshwals were in small retail businesses including garment manufacturing, but others were more enterprising and ventured into industry. In 1934, Meghji Pethraj, Premchand Vrajpar and Hemraj Nathoo formed the ‘Kenya Tanning Extract Co. Ltd’, the first factory in East Africa owned by Oshwals. Bark from trees like Mimosa was extracted and exported as solid wattle extract to 25 Countries in the World. This was a very prosperous venture. Later, Kethshi Nathoo joined this factory in 1945 and stayed on for 28 years until the factory was sold to local Africans in 1973. Shree Jain Youth League was established on 1st April 1941 under Shree Visa Oshwal Gnati. Its first chairman was Devshi Mepa Shah who continued until his demise in 1960. He was awarded the M.B.E by the Queen of England in recognition of his social and charitable work. His secretary, Shree Keshavlal Ladha Bid, was presented with a gold medal for his selfless and dedicated service. He was instrumental in spearheading the Shree Jain Youth League lottery scheme to raise funds. Most of the Oshwals were in small retail businesses including garment manufacturing, but others were more enterprising and ventured into industry. 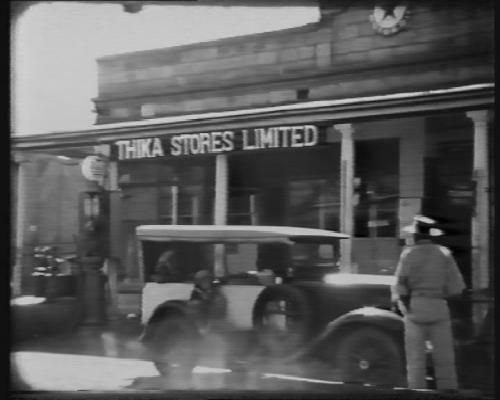 By 1941, more than 100 businesses within Thika, ranging from wholesale produce shops to retail shops dealing in household goods, textiles, hardware, restaurants, cinema hall, food stuff and groceries, were owned by Oshwals. The only entertainment at that time was to play cards or chopat (board game played with shells), which was mainly played outside the shop verandas. In 1947, Hindi Mahila Mandal was inaugurated by Thika Gnati to bring together our Oshwal ladies and other Hindu ladies. During the 1950s, Bhagwanji & Co. purchased Nath Brothers (a textile mill) in Thika. After a few years the name of Nath brothers was changed to Thika Cloth Mills Limited. During this time, though Kenya was under the British colony, a lot of political activity was taking place with the Mau Mau revolution and emergency being declared. Thika, being the epi-centre of political activity in central province, Oshwals had to be very careful in their day-to-day activities and their relations with both the local African and British rulers. By the time Kenya gained its independence on 12th December 1963, the Oshwal population had reached about 1,000 people. All Jain and Hindu religious functions were held with both communities together supporting each other. Between 1968 and 1972, most Oshwals closed down shop and migrated to the United Kingdom (UK) for fear of a backlash after the Kenyan government started introducing Kenyanisation in businesses owned by Asians of British origin. However, from 1978, other Oshwal industries started, mainly in baking, wheat and maize flour milling, sweet factories, vegetable oil factories, etc. Today Thika Oshwals own some of the biggest industries in Kenya. In 1980, the Thika Shree Visa Oshwal Community held the first Shah Free Eye Camp. Due to the tax exemption status of Shree Jain Youth League, it was agreed to revive it and since then, all the preceding Eye and ENT Camps have been held under the banner of Shree Jain Youth League. The Shah Free Eye and ENT Camps have been the biggest medical camps outside India. For the last 30 years Thika’s Oshwal, Dr. S.K. Savla from Bombay, has been giving his voluntary service as the team leader of all the doctors from India. Thousands of poor Kenyans with sight and sound ailments have benefited from this great humanitarian work.